Columbia, Missouri has a way of winning people over. With three colleges, a lively downtown and plenty of beautiful outdoor areas, there’s always something new and exciting happening in Columbia. USA Mortgage is a premium relocation lender in Columbia, and we love introducing new residents to the area. If you’re planning to relocate to our town, here are a few things you have to look forward to. Columbia adds new trophies to its shelves each year. Most recently, it was named one of the 100 best places to live, coming in at #21. It was recognized because of numerous quality-of-life features, such as a strong healthcare system and diverse housing options. Columbia is consistently named one of the top 10 college towns in the country, and it wins more niche awards as well. Columbia has been called one of the best places for working women, one of the most stylish cities and the best place to start a business. Even non-locals agree that Columbia is a pretty amazing place to be. Columbia is a quintessential college town. 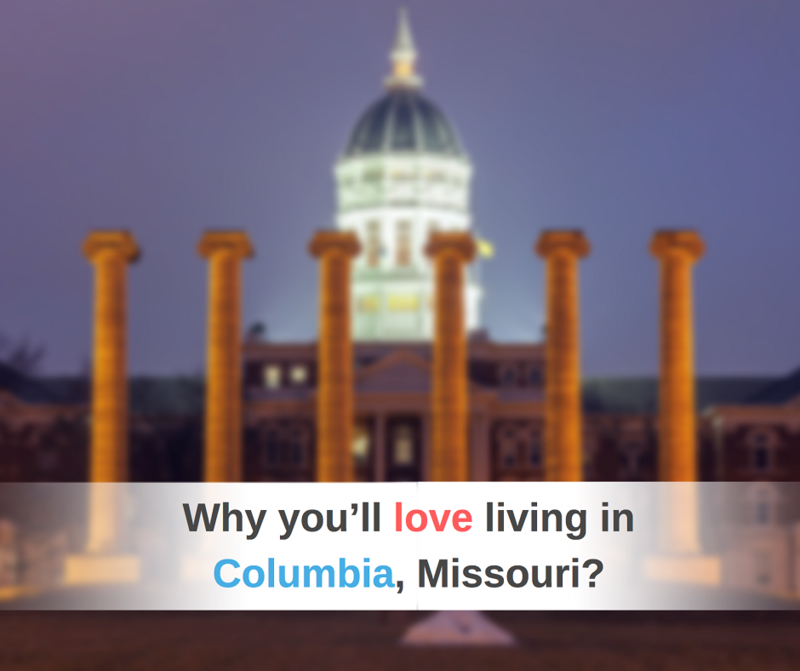 It’s home to three four-year colleges: the University of Missouri, Stephens College and Columbia College. In Columbia, the whole town enjoys Mizzou Tigers game days. Each football game is a blast, but the homecoming game is always the biggest celebration. Mizzou is credited with creating homecoming, and today it’s a weekend-long event that the whole family can enjoy. Check out this year’s football schedule to plan which football games to attend – and make sure that homecoming is one of them! Stephens College is a women’s college in Columbia. Founded in 1833, it holds the title of the second-oldest women’s college in the country. It has many events that are open to the community, including plays and musicals performed by its renowned theatre program. In 2005 it began the Citizen Jane Film Festival, which features independent films by women filmmakers. Columbia College is a private, liberal arts and sciences college. Its students enjoy small class sizes and can choose from a variety of associate’s, bachelor’s and master’s programs. If you enjoy getting outside and staying active, then Columbia is the perfect place for you. Locals love the MKT Trail, an award-winning bike and walking trail built on the old MKT railroad tracks. You can also head to Devil’s Icebox, an area of Rock Bridge Memorial State Park where you can hike and explore caves. Check out the Pinnacles Youth Park Trail for even more hiking and beautiful views. It’s hard to be bored in Columbia. If you enjoy food, spend time making reservations at the abundance of locally owned and operated restaurants in the area. If music is your passion, you’ll love the town’s live music venues, such as The Blue Note and Rose Music Hall. There are plenty of movie theatres, including Ragtag Cinema, which shows independent films. And keep tabs on university happenings – the colleges in town often bring in speakers and hold events that are open to the community. Columbia also attracts annual events. Every March, the town hosts True/False Film Festival, a renowned four-day documentary film festival. For twelve years, Columbia has been home to the Roots N Blues BBQ Festival, where people enjoy good music and great food. These opportunities, and many more like them, make Columbia an entertainment destination. You can see why USA Mortgage choose Columbia MO as one of our preferred locations of business and to call home! Columbia is a great place to call home. If you need help relocating, give me a call. I’d love to help you get settled into this awesome town.